It’s been a hectic and busy start to 2017 to say the least. I realise we are into May already.I can’t recall when I last sat down with my cup of coffee and got down to posting for my blog. I now teach at a Hospitality Institute here in Mumbai and head the Bakery & Patisserie program. It’s been one fabulous year and I love what I do…which is teach of course. Keep Calm and Bake on! The quintessential mantra in my kitchen as I begin my day at The RPH Institute of Hospitality Management. A sense of utmost tranquility prevails when I come in to commence preparation for the class. Of course this is the calm before the storm. Welcome to my world of elevated excitement interspersed with high decibels of noise and commotion, as I take on my task of instructing a bunch of enthusiastic bakers that are keen on bakery specialization The students arrive and I begin with a talk on how Baking is a Science. “Measure, Measure and Measure”, accurately I chime in a high-pitched tone to set the rule for the baking session, as getting things done to perfection is what I strive for, when I teach. After all baking is all about measuring to the T. The advice is heeded by most and it’s a pleasure to see some very talented baker’s in my class. Each session of the bakery practical covers various hands on methods of Bread making, Various Cakes & Pastries and Desserts. Teaching is indeed a rewarding profession. The reward is more emotional, especially when your students excel and create exceptional work. School’s out and I’m on a month’s summer break now. This morning I managed to take a quick peek into my blog account after ages. 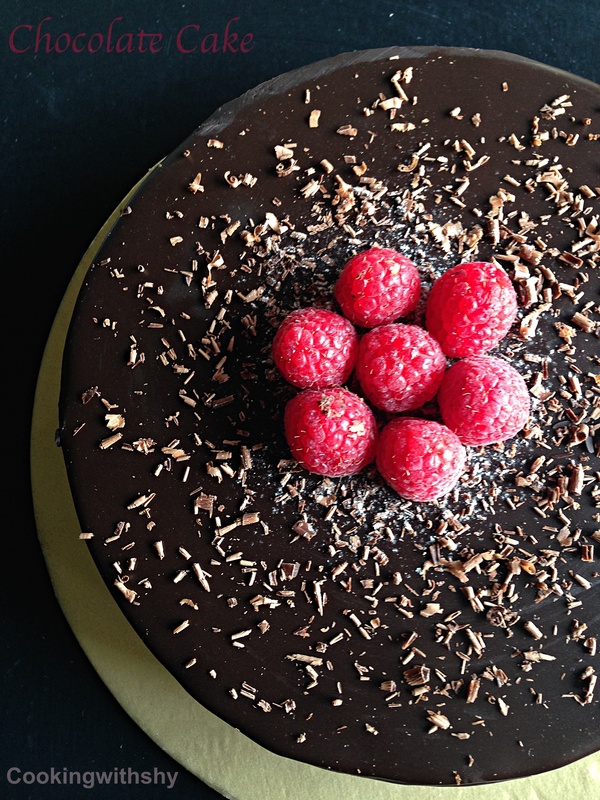 I have been meaning to share my favourite to go recipe for an easy and decadent Chocolate Gateaux smothered with an equally rich and creamy Chocolate ganache, dusted with chocolate shavings and garnished with fresh raspberries. an absolute show stopper and perfect for summer entertaining. 1. Heat oven to 180 C. Grease and flour one 9 inch round baking pan. 2. Sift flour, cocoa, baking powder, baking soda and salt in large bowl. Then stir in the sugar. Add eggs, milk, oil and vanilla; beat on medium speed of mixer 2 minutes. Stir in boiling water (batter will be thin). Pour batter into prepared pans. 3. 3 Bake 30 to 35 minutes or until wooden pick inserted in center comes out clean. Cool 10 minutes; remove from pans to wire racks. Cool completely. 4. Divide the cake into two halves using a very sharp knife. 5. Frost with chocolate ganache. Dust with some chocolate shavings and garnish with fresh raspberries. 1. Place the chocolate chips and water in a small saucepan .Now place this saucepan over a pan filled with water and place on medium heat .Keep stirring till all the chocolate melts. 2. Once the chocolate has melted. Keep aside from fire. 3. Cut the butter into small pieces and whisk into the melted chocolate till completely incorporated. It’s been baking mayhem in my kitchen these past few weeks.I’ve been testing out scores of recipes from breads, pastries,tarts and cookies of course.While most of this has been work related,I decided that I would treat myself to a nice,warm and gooey cookie.And the reason I say for myself is ,when I bake up stuff for the test kitchen,I barely ever land up eating the baked goods.Most often they are packed off to family and friends and a small sampler kept aside for the dear hubs who is ever willing to sample and indulge in my baking. I had actually started off on another post which is related to a recent getaway to a vineyard located a couple of hours from Mumbai.This post was written up in the middle of the baking mania as was just too excited to share one of my favourite cookie recipe’s with you. 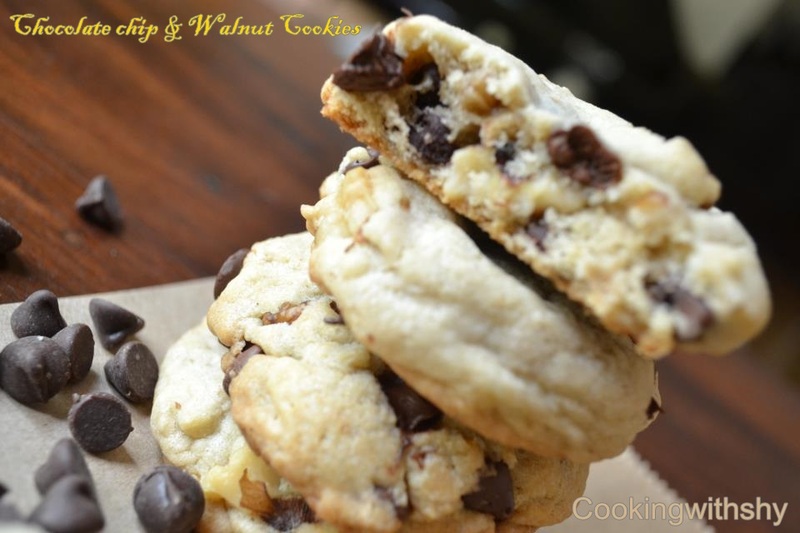 Oh I do have a soft spot for Cookies of course and especially these gorgeous one’s which are loaded with chocolate chips and some walnuts that add a nice bite to them.I love the addition of nuts when baking cookies.I feel they make the cookie more complete and add a nice texture to it as well. These are fairly easy and quick to bake up.If at any time you feel that the cookie dough seems soft,just refrigerate the dough for about 2o minutes before laying them on a baking tray.These bake really fast so do keep an eye on them to prevent them from burning. Oh yes,it’s that time of the year again! It’s Christmas time.Lets get this festive season started with some baking. Christmas baking over the years meant lots of sugar cookies,gingerbread men,puddings,mince pies and Christmas cake of of course. The key to a good Christmas cake starts perhaps days,months or even a year in advance.It’s all about pre soaking the mixture of Raisins,Sultanas,Cranberries and the mixed Peel in some alcohol which lends a wonderful and delicious moistness to this fruit cake.Now if you are pressed for time like I was whilst baking this cake,ensure that the mixture is soaked at least 24 hours before baking the cake. A good Dark rum works great or perhaps even some Brandy,Sherry or some Orange liqueuer.I landed up using some Cuban spiced rum in my pre soak and gosh the house smells boozy! Well here it is my recipe for a rich,moist and boozy Christmas Cake.I’ve actually followed the basics of the original recipe from Joy Of Baking and have tweaked it around a bit. This cake is a huge hit every year. Each one in the family wanted their own cake this year,with no one compromising to share at all.The possessive husband wanted it all to himself, the impatient Sister couldn’t wait to get her share,and of course there was the Bro in law who said would like two please…I also had my Mum,Mum in law and endless friends that were on the list too.And least I forget to pack some for my darling son who I plan to meet in Spain over the holidays! So I’ve had a busy past week in my kitchen baking up these cakes for everyone…. 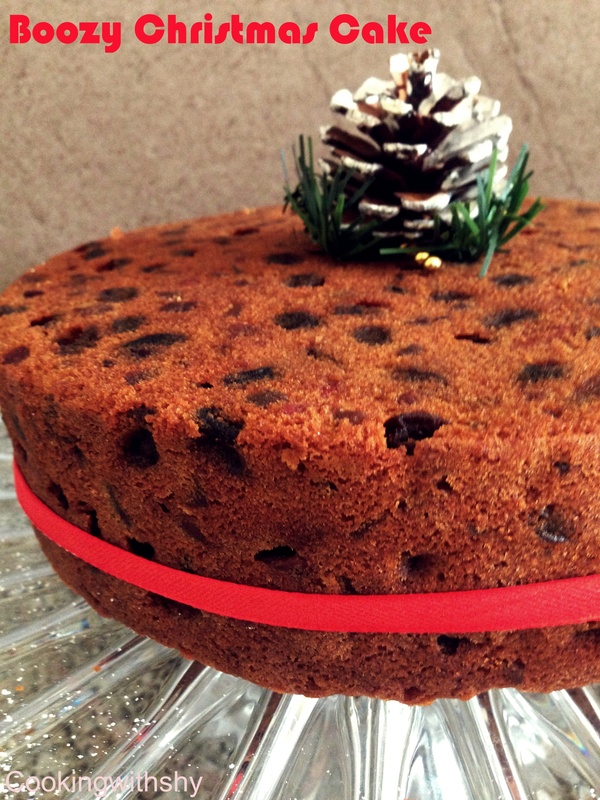 It’s still nine sleeps to Christmas,so go ahead and soak some fruit up and bake this cake. Merry Christmas dear readers and hope you have a wonderful time with your families and loved ones! Pre soak all the dried fruit in the Rum or Brandy at least 24-48 hours before making the cake. If you have time even a week or month ahead. 1.Preheat oven to 160 C.
2.Grease an 8 inch (20 cm) spring form pan with butter or oil. Line the bottom of the pan with parchment paper. Also line the sides of the pan with a strip of parchment paper. 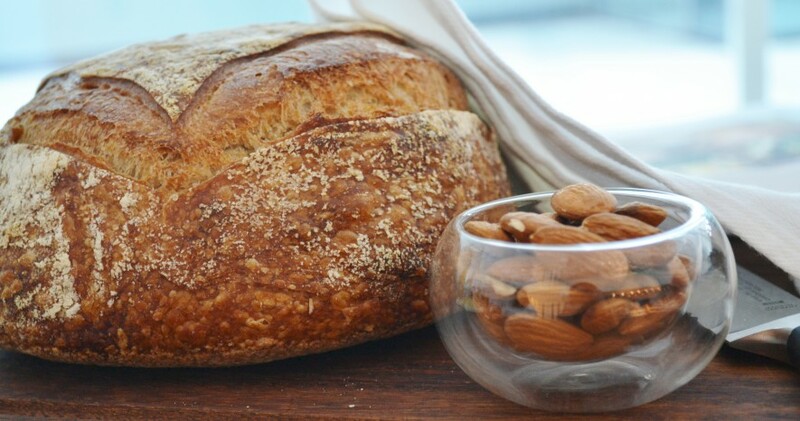 3.In a separate bowl, whisk together the flour, ground almonds, salt, and baking powder. 4.In another bowl beat the butter until creamy. Add the sugar and beat until light and fluffy. Add the eggs, one at a time, and beat well.Try not hoover beat else the mixture will curdle. Scrape down the sides and bottom of your bowl as needed. Now add in the orange juice. 5.Now fold in the chopped nuts and all the dried and candied fruits.Mix well. 7.Pour the batter into the prepared tin. Place the spring form pan on a larger baking sheet. 8.Bake in your preheated oven for 1 hour. Reduce the oven temperature to 150 degrees and continue to bake the cake for about 80-90 minutes. Insert a toothpick to check for doneness. 8.Remove the cake from the oven and let it cool for 20 minutes.Now loosen the cake from the spring form pan and leave on a wire rack to cool completely. 9.Prick some holes all over the cake with a toothpick and spoon some rum or orange liquor over the cake. 10.Cling wrap the cake and store in an airtight container. 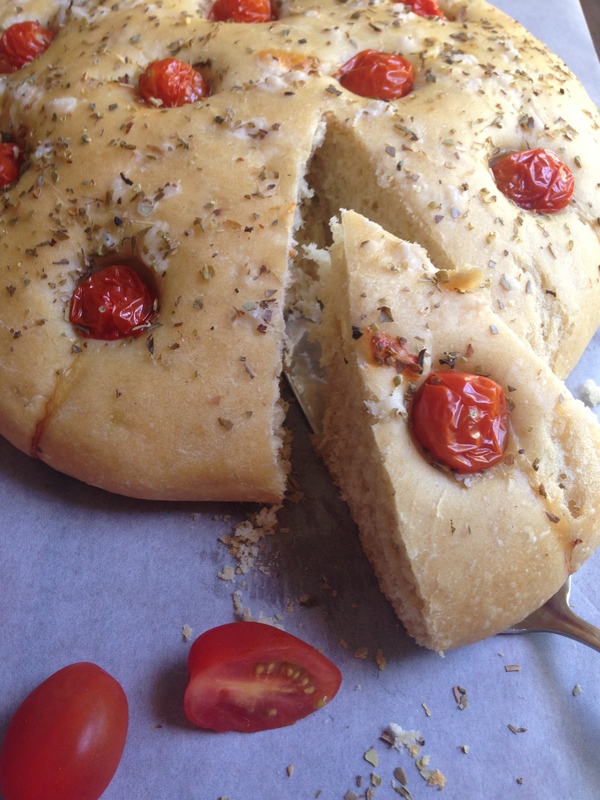 This wonderful Cherry Tomato is my first bake from the wonderful book that I received when I bought my Kitchenaid Artisan Standup Mixer in Dubai last year.Well I have experimented with lots more from the book,just haven’t got around to posting these beautiful recipes. Well I’m quite a recipe book junkie. Aren’t we all?Most often bed time reading lands up being recipe reading.I just love browsing through the multitude of recipes and images and of course make notes of what’s next on the baking agenda.Sometimes the lists are endless and don’t even get to even half of the recipes. The Kitchen aid recipe book has an assortment of various recipes,ranging from Sauces, Pasta dough recipes, Breads of all kinds,Pastries and Pies and lots more. These images have been in my folder for ever so long.Well that’s just a normal day in the life of a blogger I guess. I sometimes worry that I may suffer from ADD.I probably bake one thing,I’m editing images of another recipe and well land up blogging about something totally different.Well what matters most is that I do post all the recipes that I try out.So here goes. 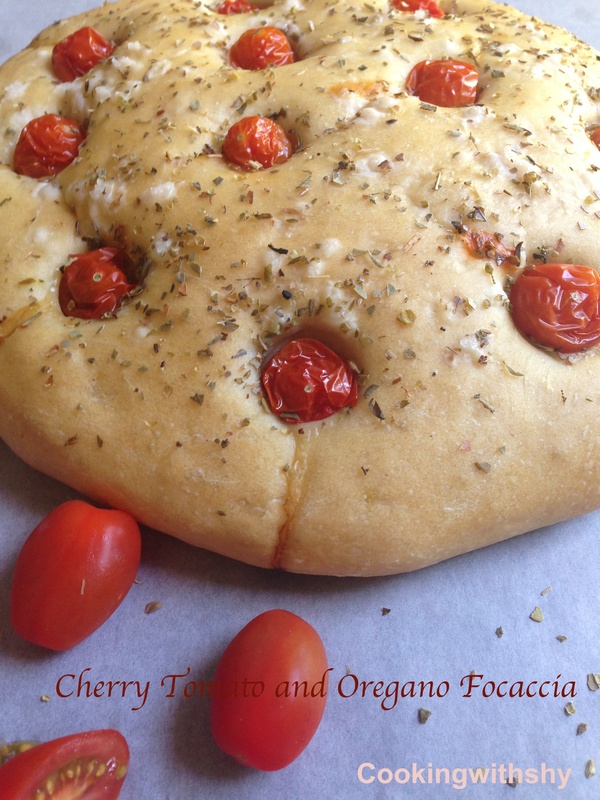 This Focaccia is an easy recipe to follow and does not require much skill at all.I’ve used cherry tomatoes and some Oregano and flavoured it with Olive oil and sea salt.Nothing beats the taste and smell of warm and fresh bread out of the oven.So worth the effort! Warning: Won”t last long as tastes delicious, hot out of the oven.Highly recommend baking two loaves at a time:) Happy Baking! Mix the yeast in the lukewarm water.Stir in the sugar and let it rest for 10 minutes or until foamy,if using active dried yeast. Stir in the Olive oil. Mix the flour and salt in the mixer. Use the dough hook to knead and gradually add in the yeast. The dough should be soft. Cover with a damp kitchen towel and leave it to rise for about 1 hour and 30 minutes. Knock down the dough and add in the dried Oregano. Roll each portion into circles. Place them on a greased baking tray. Make indents with your fingers in each circle. Push a cherry tomato into each indent. Cover again with a damp towel and leave to rise for 30 minutes. Drizzle the dough with Olive oil and sprinkle some sea salt. Well as the popular saying goes “When Life gives you lemons make Lemonade”.And if it gives you Oranges then go ahead and bake up this delicious Orange cake and add in some marmalade for that extra citrusy Zing. Now I’ve been contemplating baking an Orange for a while now.There have been days when all the ingredients were all out,yet the cake just didn’t get baked.Just one of those phases you go through when you’ve been baking a lot. This afternoon I had three lone Oranges giving me a nod of approval.Almost to say C’mon and bake that cake will you! The dear son vouched that he will not even have a bit…too much sugar he said and went about doing his thing.I was quite excited to bake this afternoon and so out came all the ingredients again. Now I had been browsing some recipes that called for the oranges being stewed and then placed top of the cake when done. 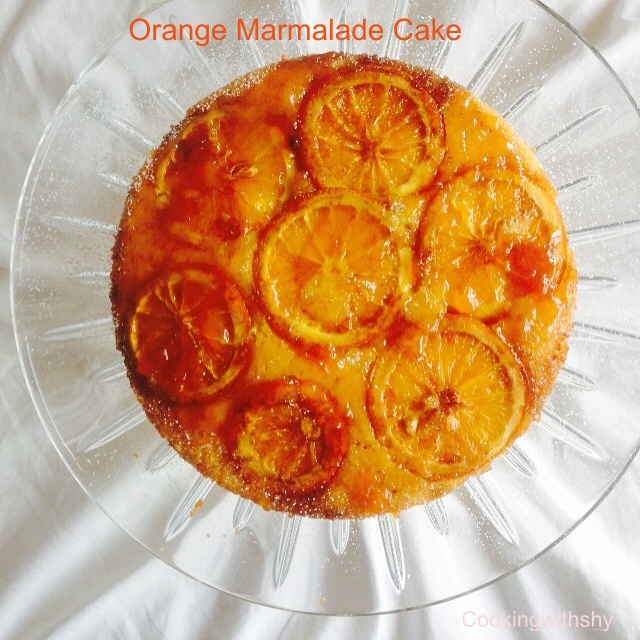 Where as I came across a Jamie Oliver Orange Cake recipe that I quite liked. It called for finely slicing the oranges and layering them at the bottom of the baking pan.I have minimally adapted this recipe from Jamie’s. With Eid around the corner,I’ve added a slight middle eastern twist of adding in some saffron strands and cardamon powder. I must say this Orange cake turned out really quite delicious. The Orange zest and the fresh orange juice lend it a wonderful burst of flavour. I choose to glaze the finished cake with some warm marmalade in the end. Excitedly I called my Mom over to come and have a slice of this cake and a cuppa tea. She quite loved it.Best of all,the dear son who was out all afternoon,comes home and devourer a couple of slices! So much for his not wanting to eat it. Well who could resist a slice of Deliciousness? Some saffron strands which can be soaked in the orange juice and about half a teaspoon cardamom powder. Another interesting twist is to reduce the juice of 1 orange and instead add equivalent amount of rose water. 2.Grease the base and sides of a 23cm loose-bottomed cake tin. Sprinkle the base with brown sugar. Arrange the orange slices on the base of the tin in a slightly overlapping layer. 2. Cream the butter and caster sugar until creamy. 3. Carefully pour the cake batter into the tin. Place in the oven and bake for about 45-50 minutes, till golden and firm to touch. Remove from the oven and allow to stand for a few minutes. Very carefully, while it’s still slightly warm, turn out the cake onto a serving plate. 4. Prick holes in the cake with a skewer. Make a glaze by warming the rest of the marmalade in a pan with a little water. Spoon this over the cake.